Habit: Annual 12--50 cm, aromatic. Stem: erect, 0--few-branched distal to base, short-stiff-hairy, glandular. Leaf: 20--120 mm; blade generally = petiole, ovate to round, proximal compound (leaflets 3--7, rounded or toothed), distal lobed to compound (segments 3, generally rounded). Inflorescence: pedicels +- thread-like, 5--10 mm in fruit, proximal > distal, densely long-hairy, glandular. Flower: calyx lobes 3--4.5 mm, 4--5.5 mm in fruit, narrowly oblanceolate, sparsely hairy, ciliate, glandular; corolla 5--7 mm, bell-shaped, tube white, lobes lavender to purple or blue (white), scales fused to filament bases, crescent-shaped to oblong; stamens 6--8 mm, glabrous, filaments, pollen purple; style 6--8 mm, cleft 1/2, glabrous. Fruit: 3--3.5 mm, +- spheric, puberulent. Seed: generally 4, 2.5--3 mm, margin corrugated; abaxial surface pitted; adaxial surface with central ridge separating 2 longitudinal grooves, ridge corrugated. Chromosomes: n=11. 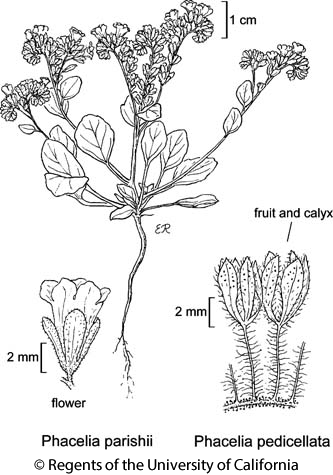 Citation for this treatment: Genevieve K. Walden, Robert Patterson, Laura M. Garrison & Debra R. Hansen 2013, Phacelia pedicellata, in Jepson Flora Project (eds.) Jepson eFlora, Revision 1, http://ucjeps.berkeley.edu/eflora/eflora_display.php?tid=37539, accessed on April 23, 2019.